Put as much potting mix as you think you’ll need in a large plastic container, add water and mix it with your hand until it is moist. I usually add a bit of Osmocote to the potting mix. Put the wet potting mixture in a seed germination tray. I prefer the seed starting kits for most of my plants. I can start 36 plants at a time that way. Firm the soil down and add a bit more mix. Make sure the mix is moist. Note – I cut out one cell so that I can water the whole tray from the bottom. Poke holes in the cell potting mixture about an inch deep with a pencil . Cut off tender, young, healthy, thick shoots from the plant in early fall. You don’t want the real small tender stems and you don’t want the hardened brown stems – you want the healthy, thick stems in-between. I usually cut off longer stems that I will later divide into cuttings. Spray the cuttings with water to get off as many bugs as possible. Place these cuttings in a plastic container of water temporarily. Take your cuttings inside out of the sun. Divide your cuttings into segments two inches long. Take off the flowers and most of the top leaves. You want to eliminate a lot of the surface area. Remove the cuttings from the water and dip the bottom cut into the rooting hormone. Put each cutting into the pencil hole and firm the mix around the cutting. Mist the leaves with water. Put on the clear plastic top on. What you’re trying to do is keep the humidity very high. Place the pot where it can get plenty of light, but not in direct sun. I start mine down in the basement under shop lights. I place the lights directly on top of the clear cover. Check the plants every day or two to make sure it stays moist. If the leaves seem dry, spray. After a month, check the bottoms of the cells to see if you have roots. You should have roots in four to eight weeks. When you have roots, take off the top. 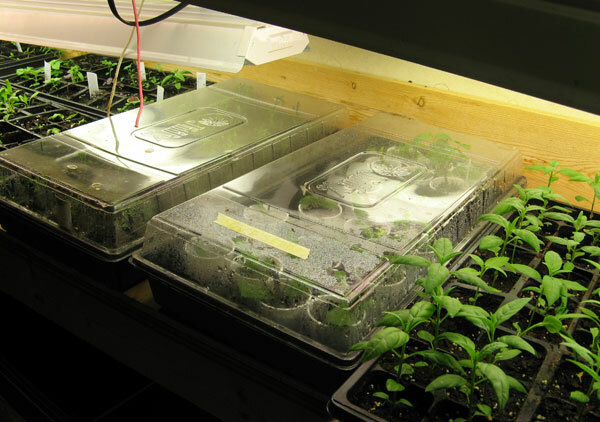 I use an oscillating fan in the basement on the plants to help prevent disease and to make the plants stronger. When you see new growth and roots, take off the plastic and then transplant your cuttings to normal potting soil. Add Osmocote to the top of each plant or use a water soluble weak fertilizer mix. April – You will need to harden these plants outside. I usually keep mine in partial shade for a couple of weeks. Reblogged this on Butterfly Gardening.